Boston Big Local in Lincolnshire has supported a ‘Boston in Bloom’ scheme to improve the look and feel of the area and to build great relationships with the local council, businesses and residents. When I heard about the Boston in Bloom scheme at a presentation at a Big Local Spring Event this year, it highlighted for me the great work that can be achieved when different groups, some statutory some voluntary, work together, without prejudice for the common good. Boston in Bloom is not a new competition and the local council has always aimed to work closely with their community to deliver it. But it was clear to see that both these groups had received fresh inspiration from Boston Big Local’s work to support and promote the project. I know from my own experience of Big Local, that local councillors only have a limited amount of time and a huge portfolio to manage. 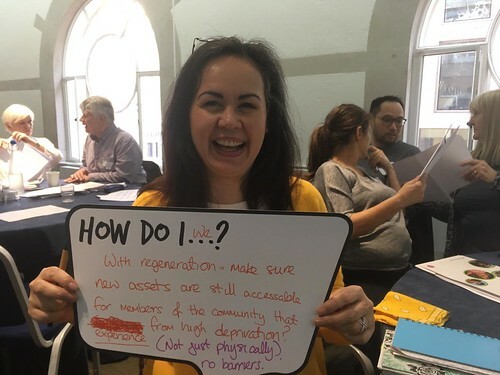 For them, engaging local residents through Big Local widens the net and means the offer is non-political, attractive and available to a much wider range of residents of all ages. For Boston Big Local, funding Boston in Bloom activities helps them work towards the objective in their Big Local plan to ‘create a more attractive environment’. It also helps them to engage with more members of the local community and so grow the volunteer numbers needed to facilitate and deliver other projects such as the annual Boston Litter Pick. Several hundred residents participated in the litter pick in 2017 but collected much less rubbish than in previous years, indicating that the message to not drop litter is getting through. Boston in Bloom 2016 saw many more local businesses sponsoring displays and this has helped to transform the town centre and other parts of the town. Boston also got gold for the second year running in the East Midlands in Bloom competition 2016. This year Boston is hosting the East Midlands in Bloom Awards Ceremony, firmly putting the town on the ‘Bloomin Map’! It was heartwarming to listen to the presentation. I know from my own area and conversations with other Big Local areas, that sometimes suspicion can surround all sides when different ‘bodies’ are thrown together with a new, volunteer resident-led group like Big Local. In Boston, the different factions are still autonomous but mutually supportive which can only be of immediate and lasting benefit to the town and its population. If Big Local is to have a legacy it may be along the lines of what Boston have shown… that only good can come out of conversation.